With James Johnson and Jeff Teague moving onto the NBA, weve finally gotten a chance to evaluate a more mature Al-Farouq Aminu in a featured role. 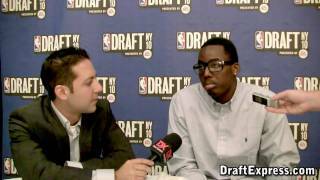 While his turnovers are up and his efficiency has taken a hit, there is no question that Aminu brings some pretty coveted things to the table as an NBA prospect. The biggest change that much be discussed is the new role Aminu has found himself in. Mostly asked to operate last year a raw and awkward looking small forward, likely due to assurances that were made on the recruiting trail, Aminu has looked far more comfortable as a face-up power forward this season. This appears to be his likely position in todays hyper-athletic and increasingly small-ball oriented NBA as well, playing a similar role to that of Josh Smith, Thaddeus Young, Gerald Wallace, Jeff Green and many many other combo forwards. His rebounding numbers have skyrocketed in turn, up from a solid 10.3 per-40 minutes pace adjusted last season to an outstanding 13. Hes also using his terrific length and athleticism to make more plays on the defensive end, averaging more blocks and steals than he did in the past. Wake Forest head coach Dino Gaudio gives him the freedom to grab a rebound and initiate the fast break himself, and some of Aminus most impressive moments come in these sequences. Offensively, its still difficult to describe Aminu as being an overly skilled player. Although capable of beating his defender off the dribble and getting to the basket in a straight line thanks to his quick first step and tremendously long strides, his ball-skills are still fairly rudimentary. He often loses the ball or is called for traveling immediately upon making his initial move, and really struggles to change directions or pull-up off the dribble if a defender rotates into the lane. His turnover rate (3.7 per-40p) is, as you would expect, extremely high in turn, and his 2-point percentage (50%) is a bit lower than you might expect. Aminus lack of strength and at times toughness, combined with the fact that hes often already out of control by the time he gets into the paint makes him just an average finisher around the rim in traffic. The incredibly impressive manner in which he finishes in transition (often in highlight reel fashion) leaves a lot of room for optimism in this regard, though. He does manage to draw quite a few fouls thanks to his sheer athleticism and aggressiveness, which is obviously a big plus. Nevertheless, its difficult to project Aminu developing into a great shot-creator at the NBA level, at least in his first few seasons, which is why its important that he ends up on an up-tempo team with talented guards who know how to utilize his strengths. As a shooter, Aminu doesnt appear to have made great strides since last season, at least in terms of the results were seeing thus far. Hes made just 23% of the 79 total jump-shots hes taken on the season according to Synergy Sports Technology (down from 27% last year), converting 29% of his 3-point attempts. His shooting off the dribble (1/19) has been abysmal, as hes struggled badly to make pull-up jumpers from mid-range all season long. The fact that his free throw shooting has improved slightly (67% to 71%) is a good sign, but the poor touch he shows on his jumper and the way he tends to just fling the ball at the basket hoping for the best surely isnt. Aminu will most likely have to find other ways to produce in the NBA, at least early on in his career. Where Aminu is currently at his best is in transition and crashing the offensive glass. His ability to go out of his area and come up with loose balls is truly impressive, as he seems to excellent timing running to the front of the rim with great purpose, as well as an outstanding second and third jump he utilizes to simply outquick opponents around the rim. His fantastic wingspan obviously helps a great deal here, as does the aggressiveness he shows trying to come up with extra possessions. Aminu appears to have made some strides in the post, seeing nearly twice as many possessions with his back to the basket as he did last season, and finding solid results in turn. Hes making more of a commitment to use his body to carve out space in the paint, and has terrific extension on his jump-hook to get his shot off cleanly. As his frame continues to fill out and his footwork improves, this could become a major weapon down the road. Defensively, Aminu continues to impress, as he not only has outstanding physical tools to help get the job done, but he also seems extremely committed to the task. Aminus freakish wingspan makes it nearly impossible to shoot over him in the post, as he appears to alter pretty much everything that is in his area thanks to his length. Improving his lower body strength will help him even more, as at times he tends to give up position too deep in the post to stronger big men. Unlike on the offensive end, he is equally effective as a small forward or power forward, and is versatile enough to switch onto pretty much any type of player in pick and roll situations, making him extremely valuable in todays NBA. Oftentimes Wake Forests coaching staff elects to put him on the opposing teams point guard for short stretches, something hes capable of doing thanks to his terrific length and lateral quickness. Even when he gets beat off the dribble, hes often athletic enough to just recover and come up with a big block from behind. A year younger than most players in his class, Aminu still has considerable amount of upside hes yet to tap into. As it is, hes already a potentially valuable contributor thanks to his tremendous physical tools, which should make him a useful and highly versatile rebounder, defender and transition finisher at the very least. He still has plenty of room to grow on the offensive end as well, which should define exactly how successful a pro he ends up becoming.